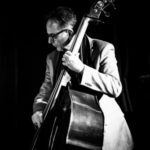 Tuesday, 18 May, 2018, saw bass player Sandy Suchodolski lead his trio through two sets of good quality jazz music based around the album release “Remembering Ray”: a tribute to the African American jazz double bassist Ray Brown known for extensive work with Oscar Peterson and Ella Fitzgerald. The evening kicked of with the Thad Jones tune “Don’t Get Sassy” and featured a great bass solo from Sandy. This was followed with a very familiar tune in “When I Fall In Love”. The opening piano playing of Rob Barron was simply beautiful to hear with the trio picking up the tempo as the tune progressed. 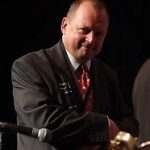 Drummer Ed Richardson’s brushwork was notable during this tune as was the swing the band had throughout – it was wonderful to hear such a familiar tune played so well and finished with such a nice flourish. 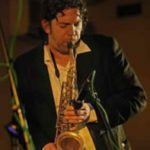 For this reviewer, the highlight of the first set – and perhaps the evening – was the trio’s take on the Miles Davis tune “Freddie Freeloader”. 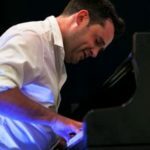 This is a fantastic jazz standard and pianist Rob Barron really looked as if he was enjoying playing this tune. It also gave Ed Richardson the first opportunity of the evening to stretch out and play a terrific drum solo – what is it about the drum solo that audiences love so much? The trio then dropped back in to the opening phrases before lifting off again to finish. I have heard this tune many times on CD but it really is so good to hear it played live and so well. The tune “Meditation”, taken from the album “Remembering Ray” had a nice Bossa nova vibe about it and was the right tune to follow what had gone previously as it gave the audience a chance to catch its breath. The Bill Evans number “Our Delight” followed and this where Sandy first references the Ray Brown album “Live From Starbucks”, which is an album that both Sandy and Rob rate highly. The pianist and drummer swapped solos during this tune with Sandy punctuating throughout with strong bass playing. Bass playing took the lead during “East Of The Sun, West Of The Moon” with Sandy playing the tune with subtle understated support from drum and piano – really good to hear the bass out front! That brought the evening to the end of the first set: glass replenishing, chats with the band, and , of course, the much anticipated raffle was drawn. The second set opened with Benny Green’s arrangement of the “Sheik Of Araby” with Ed Richardson taking the lead before being joined by piano and bass on what was a very good post break opener. The Ray Brown arrangement of “Makin’ Whoopee”, which can be heard on the “Remembering Ray” album, had piano and bass taking turns in playing the tune. This gave a familiar tune a different dimension which I particularly enjoyed. At the end of the piece Sandy referenced the film “The Fabulous Baker Boys” and that very well known scene where Michelle Pfieffer drapes herself over the piano whilst singing “Makin’ Whoopee. A lovely image that is to put in to the minds of your audience but not so good when you are trying to think about what to write about the next tune “Everything I Love”, which might be having beautiful woman singing a jazz number whilst draped over a piano. Victor Young’s “Street Of Dreams” was led by the piano of Rob Barron before bass and piano swapped tune playing duties on this beautiful ballad. Throughout the number was the delicate drumming of Ed Richardson, which showed how effective subtle drum work can lift a tune. The Ray Brown number “FSR” gave Ed Richardson another opportunity to show his skill on the kit with his second solo of the evening and a solo worth waiting for. Another jazz standard came next in the form of Johnny Green’s “Body and Soul”. Again this had the bass and piano swapping the lead on the tune, something that for this reviewer worked very well. The final number of the evening went to the final track on the “Remembering Ray” album, “Cottontail”. An upbeat number, phrases of “Salt Peanuts” and a final drum solo from Ed Richardson brought this thoroughly enjoyable evening to a close. 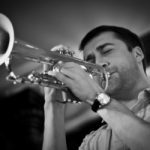 To sum up: great jazz in a great venue for an appreciative audience, what’s not to like?